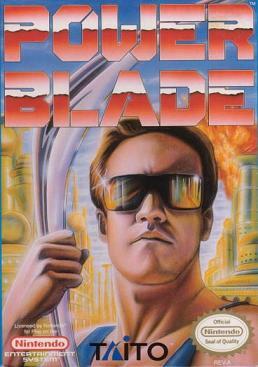 Here’s a question for you – what do you get when cross an Arnold Schwarzenegger lookalike with the makers of Chase HQ? No, unfortunately it isn’t a new version of Chase HQ featuring good ol’ Arnie released on the Playstation Network or Nintendo eShop, but something that many would resemble closest to Mega Man. Unlike Mega Man, today’s game isn’t set in the year 200X where X is an integer that could in fact be a letter and a date that is all futuristic-looking, but set in a specific year namely 2191. Quite why it was so late in the 22nd Century I have no idea but it’s refreshing to see game developers honing in on their attention to detail, but regardless of the year, does it play like a Conan-esque Mega Man or is it another platforming action game consigned to the bargain bins of retro history? 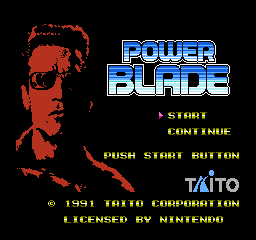 Power Blade is an action platforming game set in the remarkably accurate year of 2191, which in typical action platforming style, you have to get your character from one part of the stage to the other, however it is not a simple case of going from left to right. The direction of the level can take you up and down ladders over multiple floors, without the cool screen realignment that Mega Man 2 had. You have to retrieve data tapes which were stolen by aliens (what else) from each of the six levels and restore the master computer by defeating the alien master overlord. Of course. In order to do this, you’re equipped with a boomerang which is your weapon of choice (and also the weapon naturally to destroy alien overlords – it’s what I would naturally think of) and is used to destroy the enemies through the stages. During the stages you can get the “Power Suit” which when gotten, your character shoots energy blasts in any of the 8 directions of your d-pad and that can go through most surfaces. So when you start up the game, you get the option of starting the game from the beginning or carrying on from a position using a password system, that curiously using all 10 numbers and only the letters B D F G J and K. Quite why those letters were made who knows, there’s only so much fun that can be had from typing rude words into a password system that has a full alphabet…actually no, on some games typing rude words in is more fun than playing the game. After you choose the start game option you then provided with a normal or expert mode to play the levels – expert mode has more levels on screen and ramps up the challenge, not as intense as something like Contra but still something that will make you throw your controller on the floor. 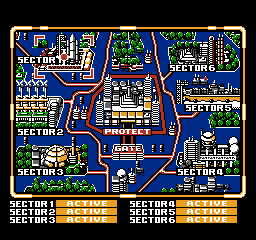 Similar to Mega Man, you get to choose which sector you start out in, and with 6 to choose from you can pick any to play when you first you’re spoilt for choice. However this is where things start to go south, as you realise when you work your way through the level that at parts, it’s not clear where you should be headed – there’s ladders going up and down, and each way brings you to a new part of the stage. You hope that when your getting lost you can press the select or start button to bring up a map, but no, there’s nothign to suggest where you should be going. 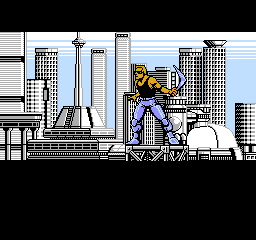 What makes it worse is that unlike Mega Man, you can be going down the ladder and to save time, drop off the ladder or not even use the ladder to go to the screen below however with Power Blade, if you don’t use the ladder you lose a life, what kind of nonsense is that? If you need to get to the screen below why not jump down rather than rigidly have to use a ladder? On the screen you have a health bar which is always good rather than one hit kills a la Contra, and also an enemy meter when you get to the boss of the stage. You also have a power bar meter which doesn’t help but show you how powerful your weapon is, no matter how tempted you are to hold the button down to charge your weapon up or for it to fly further, it still gets thrown the same amount of distance. The gameplay is smooth and responsive, when you press the d-pad your character moves instantaneously, or when you choose to attack and/or jump, there are no delays like in Dragon’s Lair. The A button in typical action platforming makes your character jump whilst the B button makes your character attack with his boomerang. What is good is that your boomerang can be launched in 8 different directions – it’s common place nowadays to have multi-directional shooting but if you grew up playing the NES then you know how frustrating it can be to only be able to attack in two or four different directions. The colours are bold and defined, and from the pixels of your character, it looks like your controlling an Arnold Schwarzenegger-type character down to his bulging biceps and not some generic plain-jane character who doesn’t resemble what is on the main screen. The music and sound effects, well they’re standard fare for a platforming game, but why worry about the audio when your gripped in an intense battle using a wooden stick that returns?? Johnny Bravo rebuilding Berlin/Seattle? What a game that would be!